In continuation of this Department's Office Memorandum of even number dated 19.01.2019, the following instructions are issued in consultation 'with' Ministry of Social Justice and Empowerment and Department of Legal Affairs regarding reservation for EWSs not covered under the reservation scheme for SCs/STs/OBCs in respect of direct recruitment in civil posts and services in the Government of India. (iii) The posts should be 'for conducting research' or for organizing, guiding and directing research'. 4.2. The property held by a "Family" in different locations or different places/cities would be clubbed while applying the land. or property holding test to determine EWS status. 4.3 The term "Family" for this purpose will include the person who seeks benefit of reservation, his/her parents and siblings below the age of 18 years as also his/her spouse and children below the age of 18 years. "The appointment is provisional and is subject to the Income and asset certificate being verified through the proper channels and if the verification reveals that the claim to belong to EWS is fake/false the services will be terminated forthwith without assigning any further reasons and without prejudice to such further action as may be taken under the provisions of the Indian Penal Code for production of fake/false certificate." 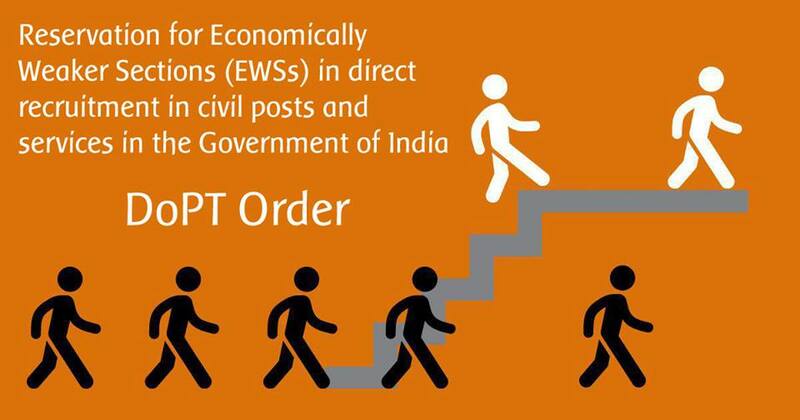 6.2 Every Government establishment shall now recast group-wise post-based reservation roster register for direct recruitment in accordance with format given in Annexure II, III, IV and V, as the case may be, for effecting 10% reservation for EWSs interpolating them with the SCs, STs and OBCs. While fixing roster point, if the EWS roster point coincides with the roster points of SCs/STs/OBCs the next available UR roster point has been allotted to the EWSs and also the principle of "squeezing" has been kept in view. While drawing up the rosters, the cadre controlling authorities may similarly "squeeze" the last points of the roster so as to meet prescribed 10% reservation.